Size (w x h): 6" x 9"
The border of this invitation says it all... "OCTOBERFEST!" 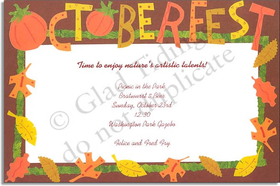 Enjoy this invitation for this favorite of German holidays celebrated each fall. Premium quality cardstock includes coordinating envelope shown. Inkjet/laser compatible and available blank or personalized.